An alternative or perhaps companion to keyword research tools, operators can help you identify the popularity of certain keywords and keyword phrases when you are optimizing a site. Although very limited in the level of information you receive, I find them a quick way to check for popularity, as you simply type in a word before your search term/keyword phrase into Google and hit ‘search’ to get your results. 1) Allintitle: This operator tells you how many web pages globally have the same keywords listed in their title tags. E.g. 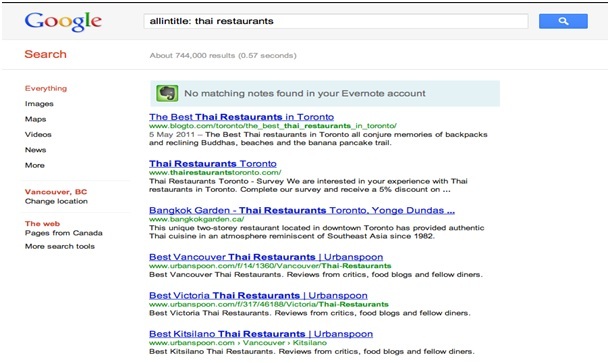 “Allintitle: thai restaurants” is typed into the search field. The SERP then reports back that 744,000 web pages on the web contain both these words in their title tag. 2) Intitle: This works the same way as Allintitle, but shows all web pages that list any of the keywords. So in the example above, if you used “intitle:” instead of “allintitle:” the SERP would reflect all websites that contained either the keyword “thai” OR the keyword “restaurants” in their title tags. 3) Allinanchor: This operator allows you to see how many links on the web are using the specific keywords. If you’d like to know more about using keyword research tools for SEO, I recently wrote a post on the new Google Keyword Planner and how it differs from the Keyword Tool.